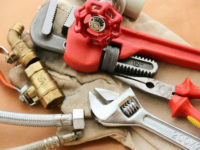 Plumbing and heating problems can impact a home or commercial property at any time. When these problems occur, it can cause serious damage to a system that can be difficult to repair. The following four problems are among the most common concerns that we fix on a regular basis. We'll also suggest a few simple fixes, though most will require professional help to manage successfully. Dripping faucets are one of the most common plumbing problems that plague the Burroughs. It causes hundreds of dollars of water loss and can even lead to pipe damage that can quickly spread. Fixing a leaky faucet requires replacing any loose rubber seals or tightening up the faucet top. Professionals can help fix this problem and keep it from becoming a serious problem. When people dump items like grease and oil down the drain, they run the risk of committing violations which can cause serious financial problems. Violating these regulations can also cause damage to a plumbing system that can be irreversible. A plumbing expert can help address these problems in a constructive way. On commercial properties, sprinklers help keep a lawn looking great. However, clogs in a sprinkler system can cause backed up water that leads to breaks in your lines. Fixing this problem requires removing the sprinkler heads and cleaning them in vinegar. If this doesn't work, professionals are needed to find the clogs and leaks and how to fix them. Weak water pressure in a home or commercial property can be severely problematic. It is usually caused by clogs or leaks. As a result, it is important to search through all the pipes in your home and get them repaired as soon as possible. This process can be exhausting and difficult to do without professional help. If your home is suffering from these problems, please contact us at C James Plumbing today. We can provide you with the skilled and high-quality plumbing repairs you need to have a well-operating water system.